America's amusement parks still can't get enough of the log flume. It doesn’t matter whether your amusement park of choice is Disney World or the local local fun park. When you visit, you’re going to see a log flume. No matter how advanced amusement technology gets, or how death-defying roller coasters become, the simple pleasures of the log ride continue to impress. Not bad for a ride based on a timber transport system. “In the parks that have them, they are always one of the more popular rides,” says Jim Futrell, a historian with the National Amusement Park Historical Association. They might seem quaint, but according to Futrell, it is this simplicity that makes log flumes such fixtures in the amusement park industry. “The ride has a broad appeal because it has an amount of thrill to it, but it is not overwhelming for little kids and older people,” he says. “And it also doesn’t drown you.” The log flume is also able to be lightly or heavily themed depending on the park, which gives it a broad business appeal. Long before the log flume was an amusement park staple, log flumes were used in an industrial setting. The first commercial log flumes were built in the mid-1800s by sawmills that used them to transport logs across long distances. Long, usually V-shaped troughs filled with water would carry freshly cut logs over chasms and tough terrain. This eliminated the need to create roads and bridges for the lumber to be transported overground. In order to maintain the long system of chutes and make sure they didn’t become clogged or broken, the owners would employ people known as “flume herders” to inspect the length of the transport channel, looking for potential log jams or broken portions of the flume. Sometimes these herders would travel down the flumes in custom-built vehicles, but more often than not, they would ride one of the logs down the path. While it was exceedingly dangerous, it was also a lot of fun. Meanwhile, as amusement park rides developed and evolved in the early 20th century, boat and chute rides began to spring up, taking their inspiration from the fun-looking logging technology. One was a ride known as “Shoot-the-Chutes,” which usually featured a larger passenger boat that would slide down a chute and skip along the water at the bottom before being manually hoisted back up the slope. Another popular boat ride was the mill ride, which was usually just a boat that floated along a trough, through darkened mill-building tunnels. 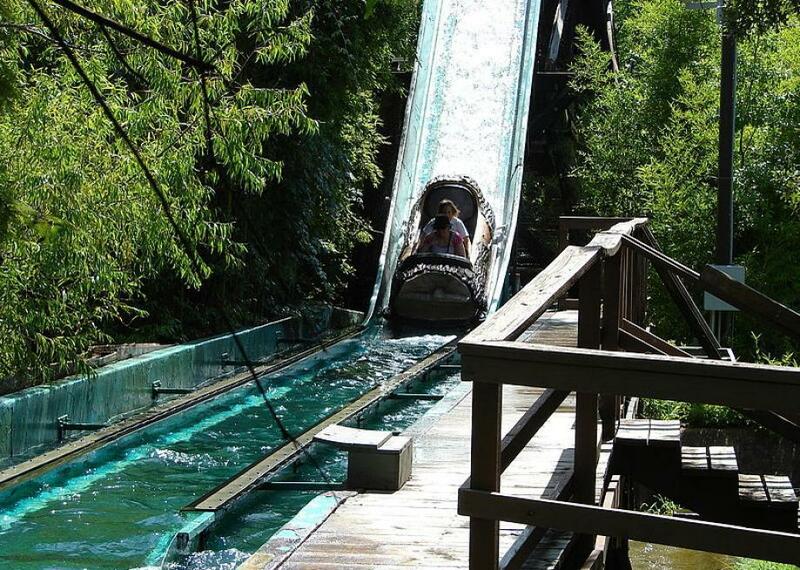 The first log flume ride as we know it today debuted in 1963 at Six Flags Over Texas. Called El Aserradero (translated as “the Sawmill”), the ride was the creation of Arrow Development, an amusement designer that had been in the business since the 1940s. 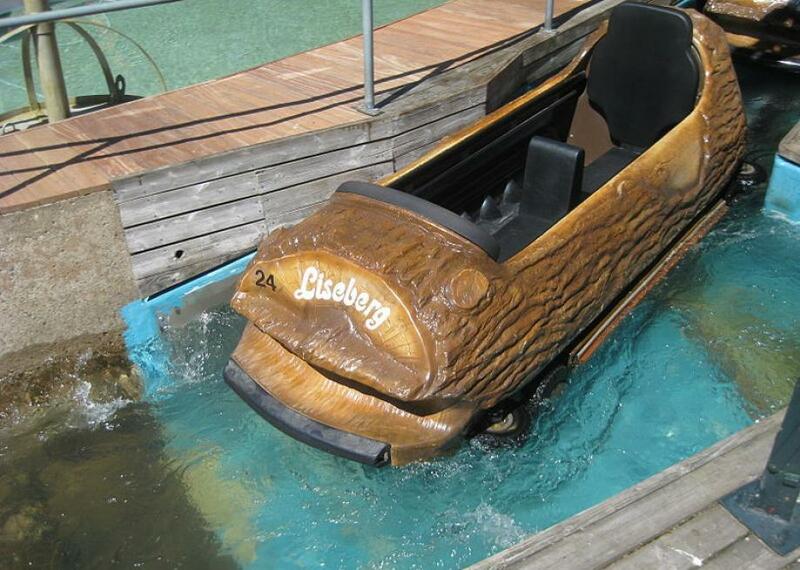 It featured two rises that the logs would travel up before crashing back down on the other side, splashing the riders. Before coming to Six Flags Over Texas, Arrow Development had worked at designing rides for the Disney parks such as the Mad Tea Party and Mr. Toad’s Wild Ride. When they came to Six Flags to install a water chute ride, they went back to the roots of the ride and turned it into a themed simulation of riding a commercial log flume. Passengers would board fiberglass logs from inside a replica mill building and ride through the flume along a shallow water trough that led to small hills. Some kept the simple logging theme, while others built more elaborate versions, like the Timber Mountain Log Ride at Knott’s Berry Farm. Disney’s Splash Mountain turned the flume ride into a perilous journey complete with animatronics, tunnels, and other flourishes. According to Futrell, the other big innovation that helped spread the log flume came in the ‘80s when the Hopkins Rides company, formerly a manufacturer of ski lifts, began selling cheaper, sturdier log flumes that used cement troughs, which were a more affordable option than the usual fiberglass for smaller and midsize parks. Nonetheless, El Aserradero is still in operation at Six Flags Over Texas. Over the years it incorporated animated figures and a covered mill building in an attempt to keep up with the more elaborate rides being developed, but those additions have since been removed, and the ride is once again a simple log flume.